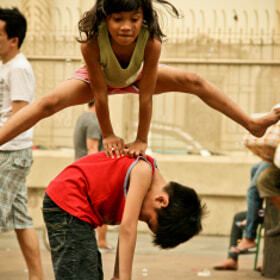 Home » Game » Philippines » Pinoy brain » Pinoy Trivia » Traditional » What traditional game jumping over the person? » What traditional game jumping over the person? What traditional game jumping over the person? A traditional Filipino game that originated from Bulacan.It involves a minimum of 3 players and a maximum of 10 players. and involves them jumping over the person. The main goal of the players is to successfully jump over the baka without touching or falling. This game not only helps youths to strengthen their bodies or serve as a beautiful and happy childhood memories. It also shows an example in a person's life that no matter how high the problem or test we are, we can still overcome it. We should not lose hope but have a strong desire to avoid and jump high so as not to be a "bet" in the real world. "Luksong baka (English: Jump over the Cow)"